Two transceivers (transmitter-receivers) with 20 foot omnidirectional antennae send and receive messages on Citizen’s Band Radio (any one of 23 possible channels) from a radius of up to 15 miles, depending on local atmospheric conditions. The transceivers are located within 10 blocks of each other; the audience will hear transmission and reception at Station I only at the Kitchen, 59 Wooster Street. (November 29-30; 8:30PM) Synthesized stereo is derived by amplifying transmission and reception separately in each space. The tonal qualities of the sound will be the reverse of each other at each station. Mabou Mines is a theater group basically involved in performance “animations” – non-psychological dramatic situations using sound, movement and language. 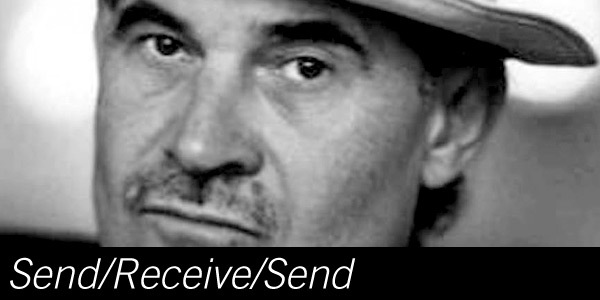 Send/Receive/Send will be their first exclusively auditory performance. Three of the performers will be at Station I and three at Station II. The Mabou Mines’ broadcasts can be intercepted and jammed by independent private stations, thus altering the timing and rhythm of the performance, and the nature of the dialogue.